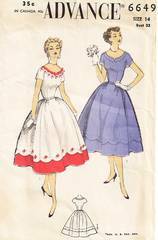 Vintage Advance sewing pattern 6649 from the late 1950's New Look Era. Misses' dress with fitted bodice has scooped neckline. The yoke-type inset is stitched inside to the facing of the scalloped edge. Three piece skirt is gathered to bodice and finished at hem with faced scallops. Lower skirt section is stitched in above line of scallops. Side zipper closing. Dress may be made in contrasting fabrics or in all one fabric. Pattern is unused and complete with pieces still in original factory folds. This pattern is from the New Look Era, late 1940's to early 1950's. The New Look Era was ushered in by Christian Dior in 1947. The designs utilized more fabric than those of the WWII era when fabric rationing was necessary.